A koozie is that thing that goes around a beer can or bottle to keep it cold. Most of the time, they’re made of foam, though other fabrics are used for specialty koozies. You’ll hear them called a beer huggers, coasties, bottle jackets, or any other number of names, but the official term is always koozie. On a hot day, your can or bottle is going to be condensing everywhere and getting warm at a very undesirable pace. Even if you’re drinking quickly - maybe it’s an outdoor party - no one likes a lukewarm drink, especially when alcohol is involved. Cookouts. Great food calls for great drinks - not warm drinks. Keep a koozie by the grill, or, if you have guests, make them readily available for anyone who wants to use them. Beach/pool. Maintaining the ice-cold temperature from the cooler is crucial. Toss some koozies in your backpack to keep drinks cold. With koozies, you can put your drinks in the sand without making them gross, too. Lounging around. Want to enjoy your drink as you relax? Put it in a koozie and you won’t have to worry about drinking it. Sporting events. Spectating of course, but playing, too. Putting a water bottle inside of a koozie will keep it cold. Warm water in the second half of the game is frustrating, especially on sweltering days where the water gets as warm as your sweat. As gifts. Everyone loves receiving multiple gifts, even if they aren’t for huge dollar amounts. A koozie is a cheap way to give someone a gift that will actually be used. You can customize it and put his or her name on the foam, or you can get creative and make a completely custom design. Using a plain, boring ol’ koozie is one approach - but it’s more fun if you get creative, especially if you’re going to be using yours frequently or on special occasions. Decorate with what you love. Sports teams, hobbies, and other interests are always safe bets, especially if you’re getting a koozie for a loved one - think about what he or she would enjoy looking at day in and day out. Commemorate a moment or event. Something happening? Get custom koozies made so everyone can remember the day for years into the future… and keep their drinks cold in the present! 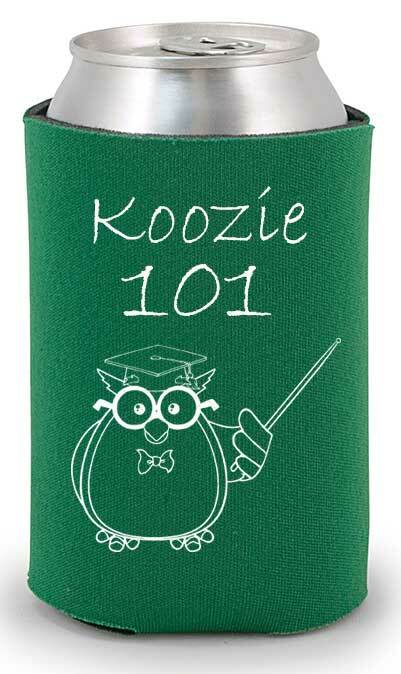 Believe it or not, although koozies are simple things, they do vary in quality by quite a bit. The good ones will keep drinks colder for longer and be able to take a beating; the lower-quality ones will still keep drinks cold, just maybe not for quite as long, and their construction may be “flimsier” overall. Perfect for large groups of people or times where the sentiment is more important than the function. Get each one for as low as under 80 cents when you buy 250 or more. Maybe you can’t spend that much on koozies, but you don’t want to get the worst ones possible, either. Take a step up to the middle level of koozie construction with collapsible versions, which are available in 10 different colors to suit every personal and company preference. Top of the line. Something about the exterior fabric just feels good in your hand, and the koozie itself will keep your drink coldest for the longest. If you’re someone who takes his or her time - maybe with a heavy double IPA - you should go for the indestructible. Although not quite as effective as a different type of filler, there’s something about foam that can’t be imitated. Foam koozies are less prone to spillage, too - it’s like you’re trying to knock a styrofoam block over sideways. It will slide, but it won’t topple. Click one of the links above to get started on customizing a koozie for yourself, your company, or an event you’re holding. Good luck, and remember to keep those drinks cold!